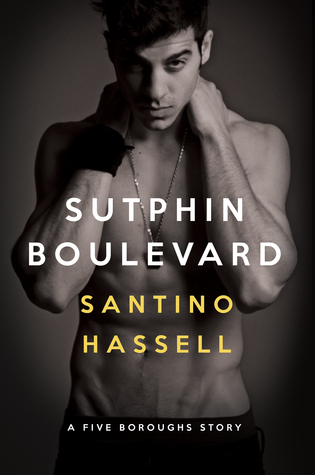 Sign into Goodreads to see if any of your friends have read Sutphin Boulevard. Elena*curiouser and curiouser* wrote: "Can I join, can I, please? :)"
<3 It's been tweaked a bit here and there, but only for the better! Evil Cat wrote: "I think it's my fave of his." Evil Cat wrote: "Now for the cover!" :) You'll love Nunzio. I'm willing to bet money on it. Nunzio...Nunzio...yeah, the name works for me! ha! Can't wait! Who wrote the blurb? Because that sounds a lot more sappy than the book I read. LenaLena wrote: "Who wrote the blurb? Because that sounds a lot more sappy than the book I read." Someone at the publisher, I suppose. Vicky wrote: "sign me up for group read...totally ready for the great Santino"
:)"The great Santino". He's a magician, all right. Evil Cat wrote: "Great review, Len. :)"
:) Thank you. Coming from you it means a lot. now thats a review ..
Karen wrote: "now thats a review .."
:) Thank you, Karen! You'll be reading it before you can say Jack Robinson! Beautiful review, Lenore! :) I can't wait to read this! Diana wrote: "Beautiful review, Lenore! :) I can't wait to read this!" Thank you, Diana! You will enjoy it for sure! This is a really wonderful review, Lenore. Alexis wrote: "This is a really wonderful review, Lenore. I really admired AFTER MIDNIGHT but this book blows it out the water, although I think you're going to be danger of writing "this is Santino's best book ..."
Haha! True. I should develop some sort of scale. "Best", "Bestest", "Very Best", "Best of the Best", "Best Times Infinity". Seriously, though. Thank you! And I'm dead chuffed you loved it. Lovely review, makes me want to read it! Anna (Bananas!) wrote: "Lovely review, makes me want to read it!" Thank you, Anna! You should definitely read it. All the feels. Thank you, Joy & Kelly! I can't wait for everyone to read it! We should discuss! I love your review, Lenore! Beautifully and very eloquently said. I think your review is a love letter to Santino and his skills as a gifted author. Baba ♥♥♥ Tyler, Marcus, Archer, Dean, Adrian, Dan & Hunter wrote: "I love your review, Lenore! Beautifully and very eloquently said. I think your review is a love letter to Santino and his skills as a gifted author. Also, you need to write a book because you have..."
I'm thrilled you liked it yourself, Baba! My review is definitely a love letter to the book and its characters. They wouldn't have been the same without Santino's talent and skill, no doubt about that. Lenore wrote: "Baba ♥♥♥ Tyler, Marcus, Archer, Dean, Adrian, Dan & Hunter wrote: "I love your review, Lenore! Beautifully and very eloquently said. I think your review is a love letter to Santino and his skills ..."
Francesca wrote: "Finally!!!! Got to read this; mine will be up soon-ish"
Amazing review. Truly. I just got this, I'm stoked to start reading. Beautiful review!! This inspires me to write better..Any tips?